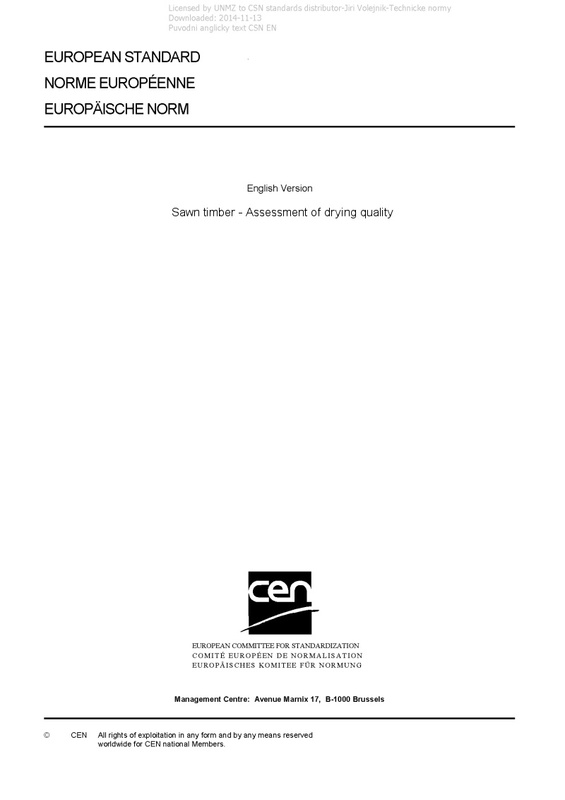 EN 14298 Sawn timber - Assessment of drying quality - This European Standard defines a method of assessment of drying quality. It applies to a lot of dried sawn timber (surfaced or not). It applies to both softwood and hardwood with a thickness not greater than 100 mm. The quality of drying is expressed in terms of moisture content: target, average of the lot and variation between the pieces of the lot. An option for specifying the degree of case-hardening is included. NOTE 1 Other features related to drying, e.g. check, shake, warp, stain, etc., are specified in documents for visual grading of sawn timber or in product specifications and are not covered by this document. NOTE 2 In the following the term "sawn timber" is used for all dried timber covered by this scope.